Before becoming India’s information technology hub, Bengaluru was known for its numerous lakes and green spaces. Rapid urbanization has led to the disappearance of many of these ecosystems. Those that remain face a range of challenges: residential and commercial construction, pollution and waste dumping, privatization, and so on. Today, Bengaluru’s lakes are principally seen as garbage dumps and sewage ponds that can have either of two fates: one, be transformed into recreational oases to suit the needs of wealthy residential neighborhoods, or two, be encroached upon until none of the original shapes and functions can be traced. But how does this affect the lives of the people living at the very margins of Bengaluru’s beloved yet contested lakes? As a result of rapid urbanization and environmental change, people’s reliance on local natural resources has substantially decreased in Bengaluru. This decrease is due to contamination of the surroundings, restrictions to access and, for some, the constant threat of eviction. Bengaluru is witnessing a transition from livelihoods dependent on use of these open spaces for activities such as fishing, cattle grazing and domestic purposes, to a cultural use of recreation and visual beauty. People are tending to move away from communal organization—such as taking turns to work on each other’s rice fields, maintaining the village grove, or sharing irrigation and lake management duties—and to move towards private organization when tending to one’s home garden or carrying out religious rituals. 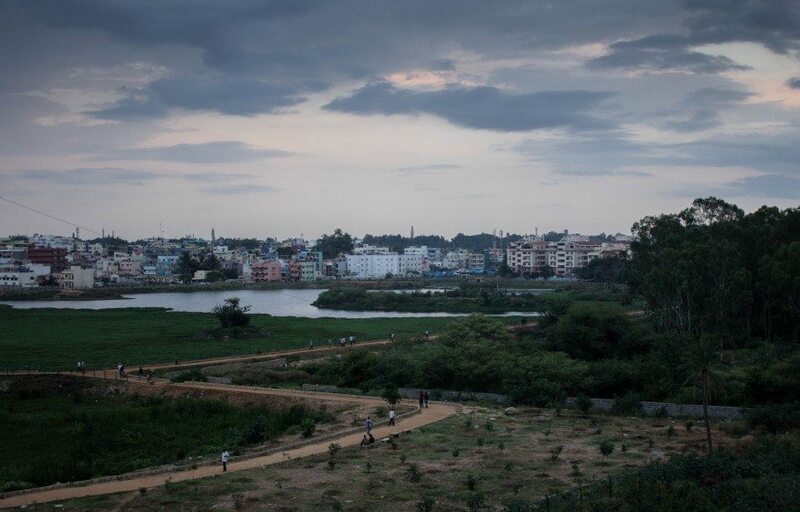 While people at the margins of lakes are often blamed for the degradation of lake ecosystems, they are actually preserving and often increasing native biodiversity and open space—acts that are quite uncommon now in a metropolis such as Bengaluru. 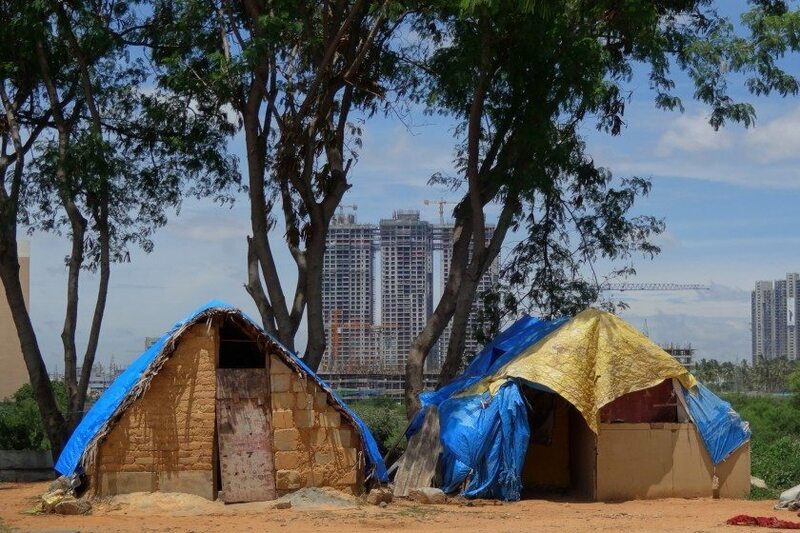 The stories of Bengaluru’s residents represent the casualties of rapid urban growth witnessed by the city, but their voices often remain unheard. To bring back these voices into the debate, we organized a photo exhibition titled “Living at the margins of Bengaluru’s lakes: Untold stories of change, loss and hope” on Oct. 31 to Nov. 1 2015 in Rangoli Metro Art Center in Bengaluru, India. A diverse audience of 900 to 1000 visitors came to the art gallery. People were in awe of the photographs and accompanying stories. “This really is an eye opener for people like us who live in the urban area. I was unaware of how lakes in the city were used by the city’s marginalized, and how severely they are impacted by the pollution of these lakes,” said Priya Dileep, an IT professional in the city. A significant feature of the exhibition was the presence of residents from the lakes, individuals who were themselves the subjects of the photographs displayed. They were astonished to see their portrait on the gallery wall, and proud. The photographers who worked on the project are Anoop Bhaskar and Arati Kumar-Rao. Anoop, born in Bengaluru, worked in a corporate environment before he decided to become a fulltime photographer. Anoop has been involved from the moment the fieldwork started. He visited all the case study lakes and assisted with the household interviews that were held in Kannada, Tamil or Hindi. During the four months the fieldwork lasted, Anoop took photographs of the people we spoke to and places we visited, because we hoped to organize an exhibition at its end. A link to Anoop’s work is here. Arati Kumar-Rao is an independent environmental photographer & journalist documenting effects of landuse change on lives, livelihoods, species, and landscapes. Her most recent work is here. We will show the photo exhibition in a few other locations across Bengaluru in the early months of 2016, starting in January at the INSEE conference and the Kaikondrahalli lake festival. 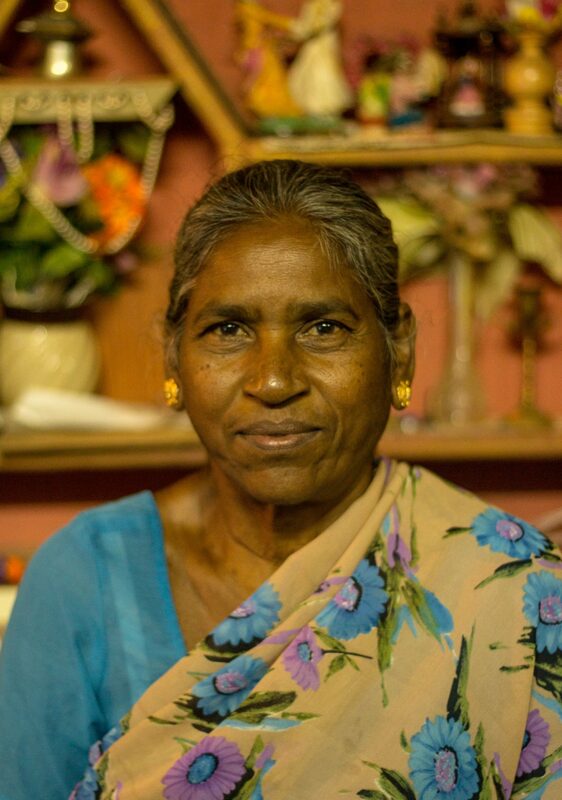 Saraswathamma is “over 30 years old” and was born at Bhattarahalli Lake. Back in the day, she and her neighbors enjoyed eating fish from the lake, but today the lake is so polluted she does not dare to touch its fish. She receives Rs.24 for each litre of milk her three cows produce. Her cooking takes place on a kerosene stove, until she runs out of fuel that she receives in her supply of monthly ration, which usually happens after 15 days. She copes by collecting firewood from cut road side trees, or by foraging from her surroundings. Soon she will need to rethink her livelihood strategies, as a demolition order demands her to leave her home ground for rehabilitation elsewhere. Rajamma has been living at Madivala Lake for over 20 years. Herding cattle runs in his family, and a year and a half ago, they decided to get four cows and four calves, which provide them with an income from the sale of milk and curd. Their house is located right at an open drain with an immensely pungent stench. The land bridge that used to connect the settlement to the lake bund has been destroyed after a murder incident. Today, Rajamma crosses the drain via a makeshift bamboo bridge to take her cattle out for grazing. Restricted access to the lake also complicates the collection of wild soppu (leafy greens) to cook green curry, which the family used to do two to three times a week in the rainy season. Buying soppu costs Rs.15. A large open drain, several meters wide, flows parallel to the eastern shore of Madivala Lake. From afar, the drain appears to be a nice little creek, but that illusion is ripped apart as soon as one moves closer: the stench is unbearable. Dozens of people live right above this open sewer and, on top of the obvious health risks, have to deal with the daily fear that their children may slip and drown in the muck. For decades, Madivala has a working Dhobi Ghat. Dhobis (launderers) washed their loads in a canal next to the lake until about 20 years ago, when the water became too polluted and they resorted to bore well water. 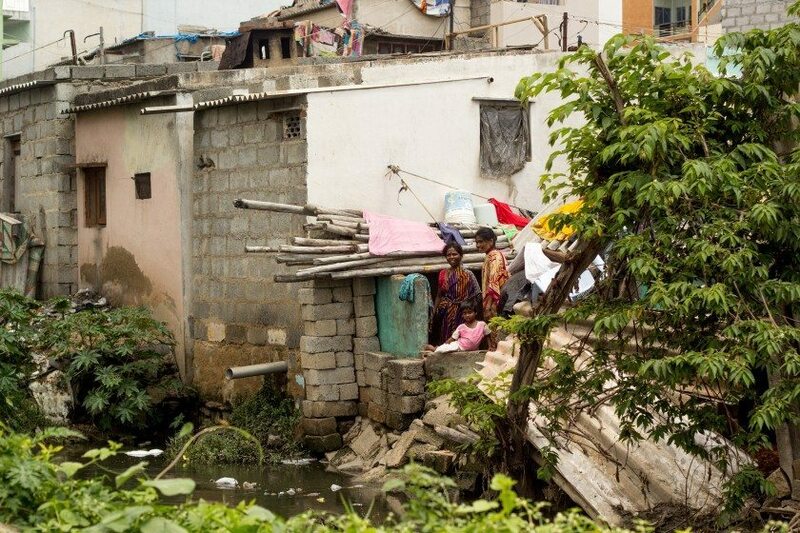 The canal turned into a bubbling and reeking sewage drain, which is an eyesore for the entire Dhobi Ghat. Concurrently, the disappearance of open lands and grazing fields has led their donkeys to the garbage dump in search of food. 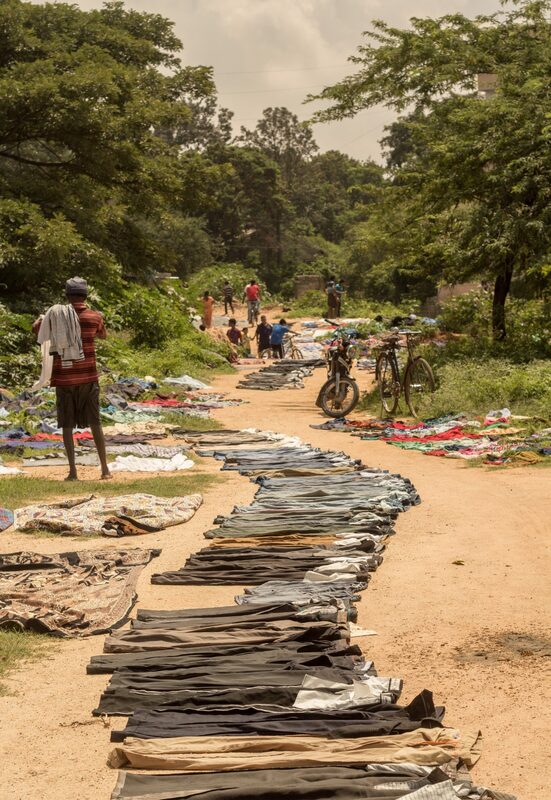 After so many years, their deteriorating environment has made the dhobis lose sight of a bright future. 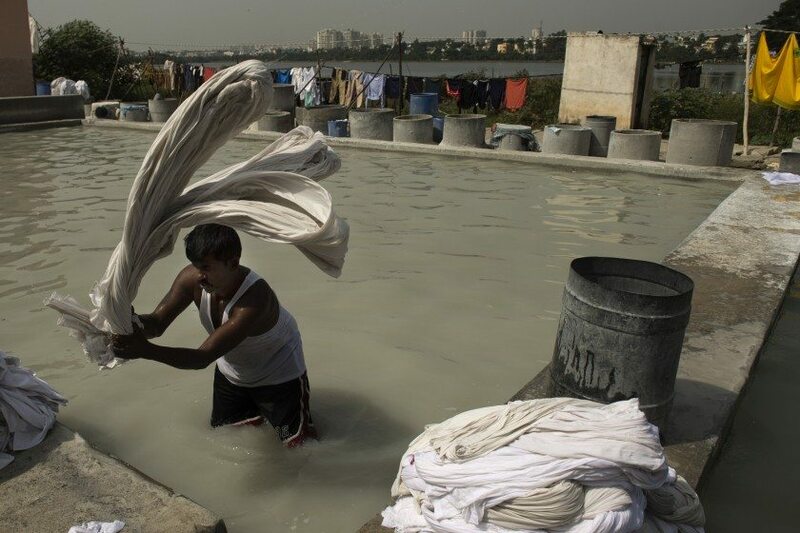 The Dhobi Ghat cannot accommodate everyone, so some launderers enter the lake to wash their clothes. After washing, the laundry is left to dry on the lake bund that turns into an elaborate patchwork of jeans, shirts and towels. People, bikes and cycles move in between the little islands of clothing as if it is the most natural thing in the world. With no other place to go, this daily sight will probably continue to exist. Yet, they are always in danger of being moved due to increased accessibility restrictions. 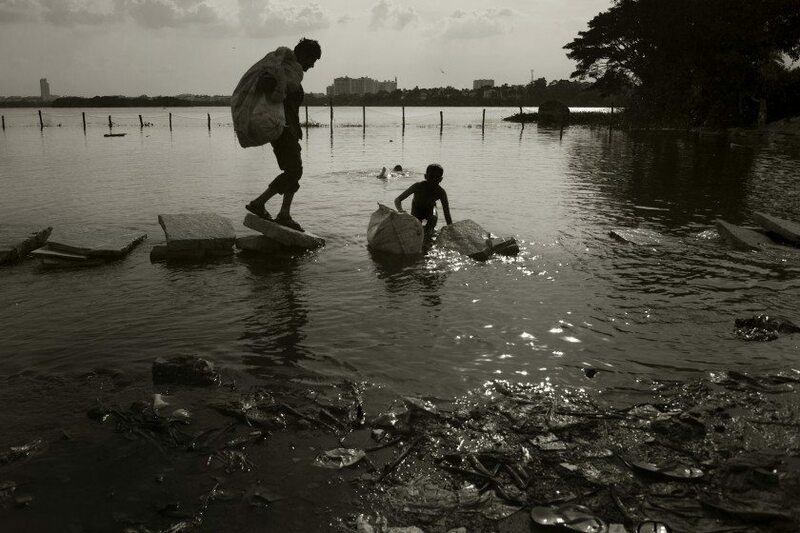 A man carries his load over the outflow of Madivala Lake. The stone slabs he uses to cross the water serve another purpose in the morning, when a group of launderers gathers here. In the evening, these shallow waters are used by children to bathe, play and catch small fish. 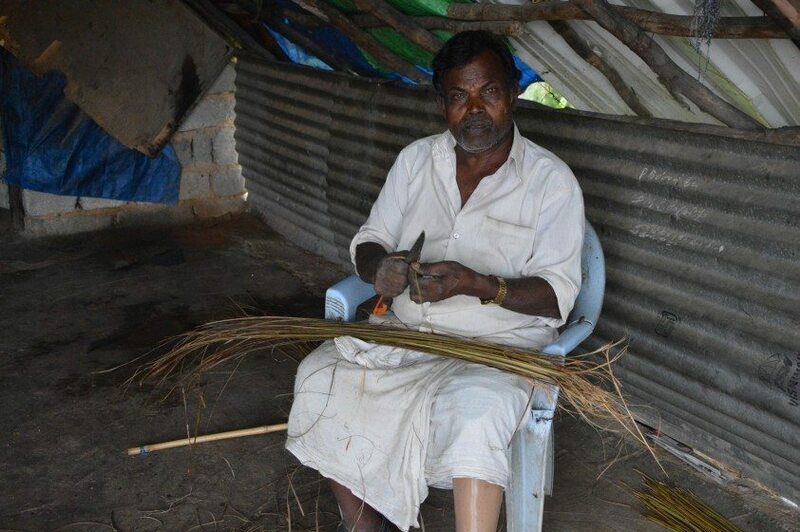 The watchman of the fishermen’s hut at Madivala Lake makes broomsticks from the veins of coconut leaves he collects nearby. He lost his leg after a bus accident. Every day, contract fishermen head out in their coracle boats to fish in the lake and sell their catch in Madivala Park. If the early morning yield is not sufficient, they head back out until lunch. This year’s pelican presence is a sign of fish abundance in Madivala Lake. When he was younger, Narayanaswamy and his father would fish in Madivala Lake. Now that all fishing has become contracted, Narayanaswamy can only fish outside of official lake borders, which has led to a tradition of fishing in the canal northeast of the lake. This fishing technique can be observed only a few times a year, when the canal at the lake outflow fills with water. The only remaining non-contracted fishing at Madivala Lake is a collaborative effort by a group of men who build a structure of nets, mud and dams made of coconut trunks to create ponds that ensure that the fish cannot escape and grow big. 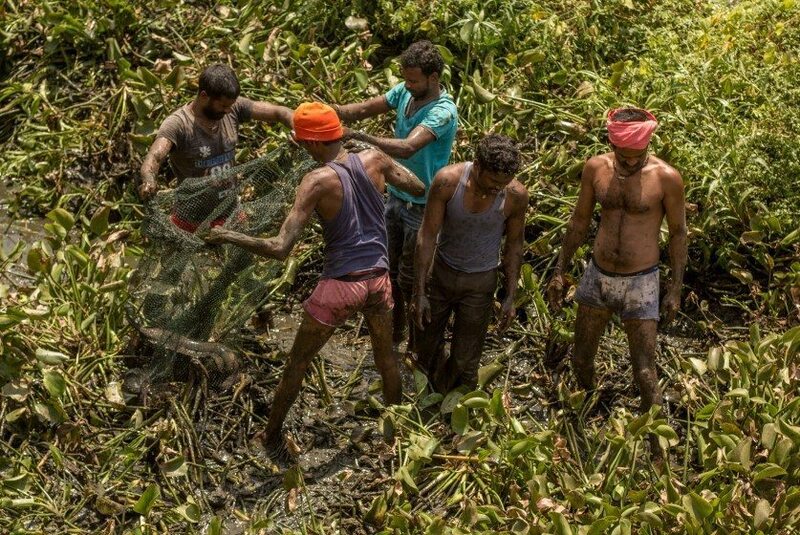 After some weeks or months, men organize themselves and start emptying the ponds with buckets, removing weeds, locating the fish hiding in the mud and catching them by hand—sometimes slinging a water snake over their shoulders. The catch is divided among them, while the exciting event entertains dozens of neighbors and passersby. These children live in a settlement of blue tarpaulin shacks northeast of Vibhutipura Lake. 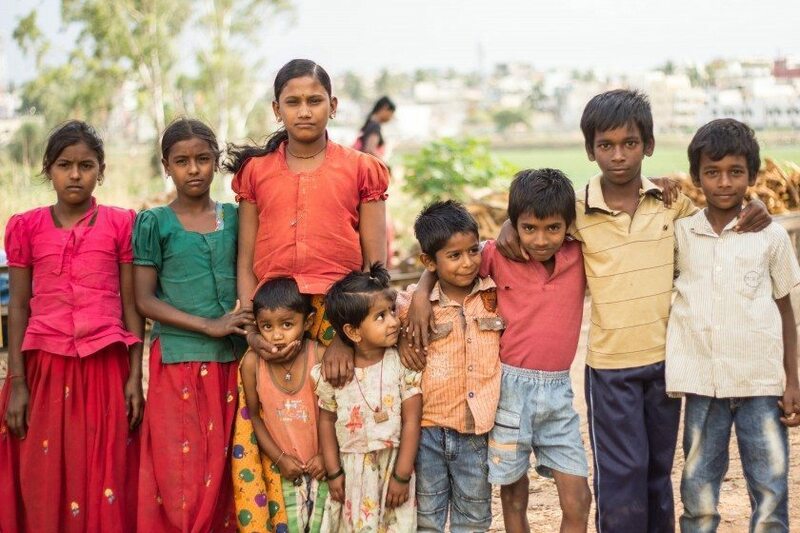 Together with their families, they migrated from rural Karnataka to Bengaluru city, fleeing the drought. Here, their fathers work as construction laborers in apartments, while their mothers work as domestic help. Their houses do not have electricity or toilets. On days when they have no water supply, they wash their clothes and vessels in the lake outflow, which is not fenced off like the rest of the lake. They cook on firewood but cannot grow their own vegetables because the land they live on is not their land. And they do not know where they will be living at the start of next school year. Jalalbe, age 14, was born near Puttenahalli Lake after her parents moved from Gulbarga to Bengaluru. 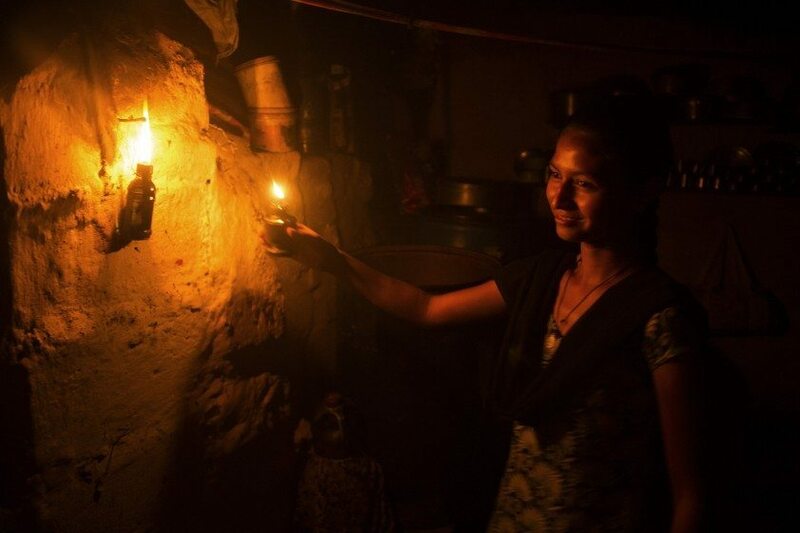 The family of six lives in a single room that lacks basic amenities; she lights a lamp every evening and cooks rice on a wood fueled stove in front of the house. Water is fetched from construction sites. Twice a year, they replace the coconut leaves on their roof to prevent it from leaking. Coconut leaves are more water resistant than tarpaulin. On the way back from school, Jalalbe walks along the lake and enjoys the view, birds and fish. She is, however, afraid of the police and security that guard the road, carrying long sticks. At night, she never goes anywhere near the lake. In her ideal world, there would be more nature to compensate for the noise, buildings and roads that surround her at present. Vibhutipura Lake used to be larger, and would flood after heavy rains. Long-time residents remember how brick factory laborers would drink lake water during their lunch breaks, and how they themselves crossed finger millet fields on their way to school. But the most rewarding trips were eastbound to the guava groves behind the paddy fields at the lake’s outflow. Today, the lake’s floodplains are encroached on by settlements, and cows are the only ones to enrich their diets at the lake. After the lake was fenced and cleaned up, it has also seen a new set of visitors: joggers and walkers from surrounding apartments and offices. 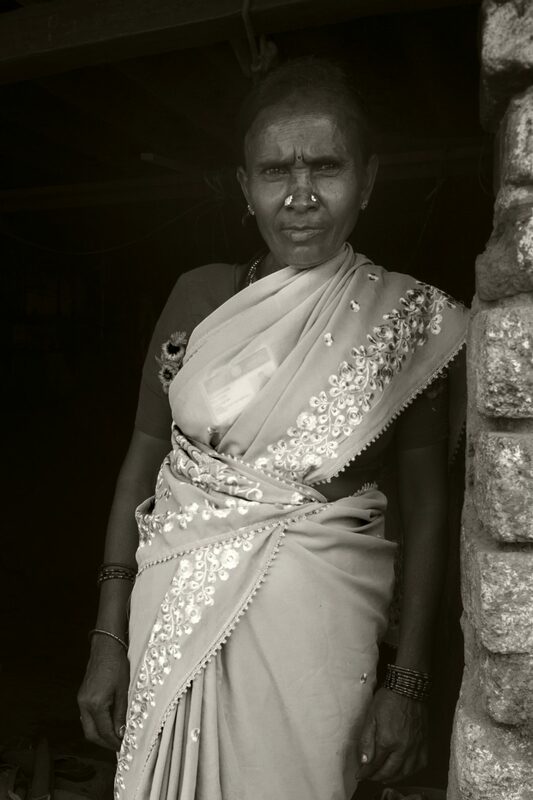 Margaret Mary, age 59, was born near Vibhutipura Lake and still sells spices in the neighbourhood. In her memory, the area was like a village, where nobody would be out on the streets after 6 p.m. Long gone are the times that she used the lake for domestic purposes. Nowadays, the aesthetic and recreational benefits are the most important features of the lake for her. Nevertheless, she feels spiritually connected to the lake, and relates the lake to her everyday happiness. Pushpamma lives with her children at Puttenahalli Lake, where she buried her husband at its eastern side. For her work as a street sweeper, she collects long grass and reeds to make broomsticks. She did not collect the huge pile of firewood next to her house: she says it is hard to find firewood now that the groves around the lake have disappeared, and she has aged. Her ability to collect healthy wild soppu (leafy greens) has diminished since the lake became fenced. Instead, she has planted a home garden with banana trees, sweet potato, tulsi, pumpkin, chili and more. Bengaluru’s lakes are small-scale representations of the city and its main challenges: a mix of the urban poor, middle-class, and elite, of urban expansion, encroachment, privatization, pollution, ecological degradation, traditional and modern uses, land disputes, and so on. 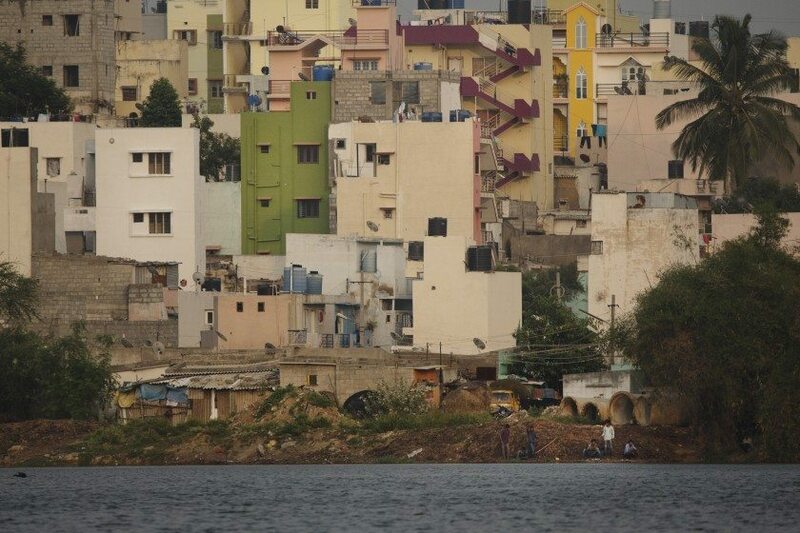 This reflection on Bhattarahalli Lake’s surface shows the rise of a 38-storey lake view apartment next to a soon-to-disappear slum settlement with its coconut, fruit and drumstick trees. 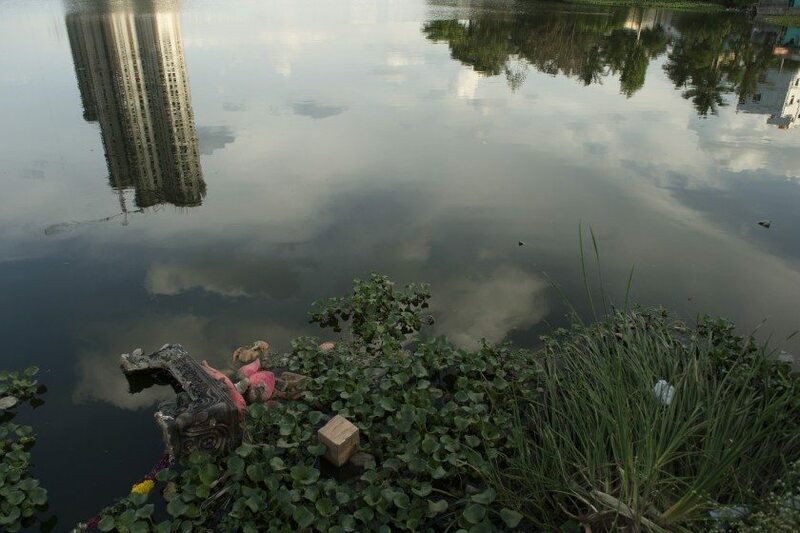 In the foreground are the remainders of an immersed Ganesha idol amidst the nutrient-hungry water weeds that are choking so many of this city’s lakes. 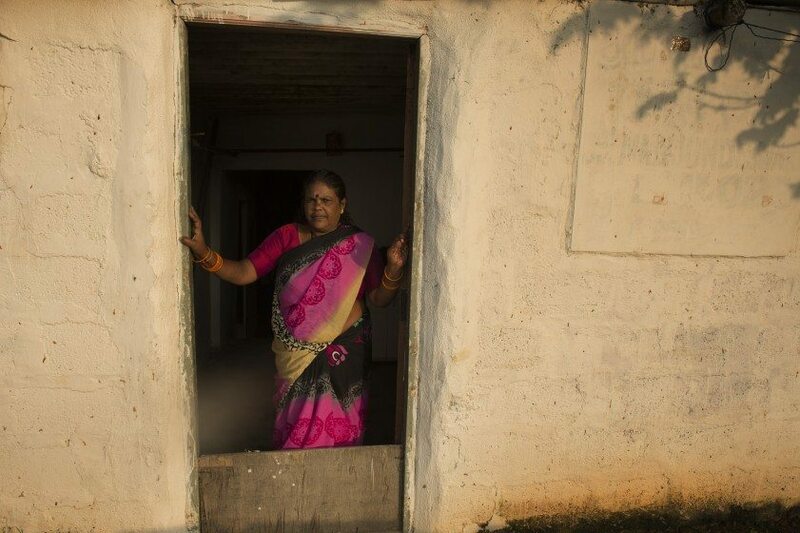 Ashwathamma is a very active citizen of the low income community living adjacent to Puttenahalli Lake. Her knowledge of ecological and geographical changes in the landscape around the lake is formidable. She has been a key member in organizing the community to fight for stay orders against eviction. She poses the question: why are there different laws for the ministers living in wealthy neighborhoods than for us? 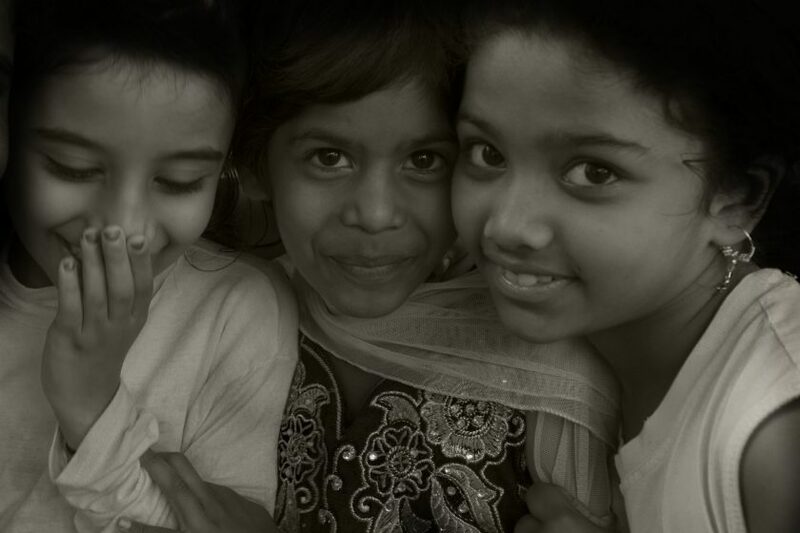 These three girls spend evenings playing with their friends in the lanes of Bhattarahalli Lake’s settlement. They grow up living at its waterfront. What are the chances that they will continue to see their lake once it is cleaned up and turned into a neat looking park? 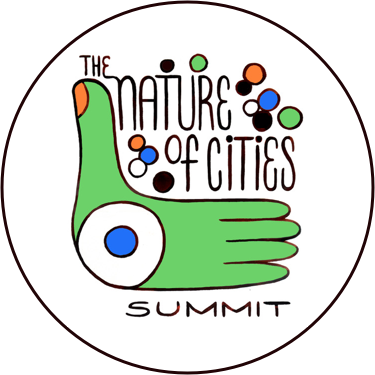 The underlying research for this project was carried out between May and October 2015 by Marthe Derkzen from VU University Amsterdam in collaboration with Harini Nagendra and Seema Mundoli from the Sustainability initiative at Azim Premji University, Bengaluru. 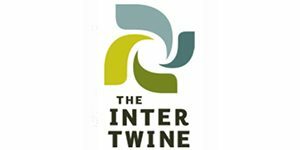 The project received financial support from an USAID PEER grant to ATREE (Ashoka trust for Research in Ecology and the Environment). I saw your recent publication in AMBIO – great work, congrats! I was wondering if you are familiar with Veena Srinivasan’s work on the lakes? 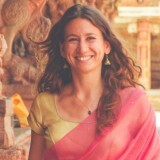 She got appointed a chair with Utrecht University and part of her work is on citizen science around Bangalore’s lakes. Will you be at the Summit? Would be lovely to hear what you’re up to. This is really beautiful, Marthe! So nice to read the different stories, adding a lot of depth to my own visits to Bengaluru’s lakes. I agree that many of the city’s broader challenges are reflected in the events happening in and around these lakes – which is also why it’s so important that the stories of less affluent and/or more vulnerable people are told. Also, Arathi and Anoop, you have created very beautiful portraits to go along with these stories. Great job!